The number of concealed carry citizens throughout America is rising rapidly. Recently the United States 4th Circuit Court of Appeals ruled on the legality of police officers frisking citizens even when the State issues concealed carry permits. In U.S. v. Robinson (2017), the 4th Circuit provided clear guidance and understanding about police and citizen encounters under such circumstances. The U.S. 4th Circuit encompasses West Virginia, Virginia, Maryland, North Carolina, and South Carolina. The decision of the 4th Circuit Court of Appeals is binding legal precedent in the 4th Circuit, but the legal principles deciding the case could easily be accepted in the other Federal Circuits. As such, understanding the Court’s decision-making process can provide a clearer understanding on the legal requirements for conducting frisks, and for citizen’s being subjected to a frisk. EDITOR’S NOTE: The Blue Sheepdog Crew are dedicated to keeping our readers informed on the latest legal rulings having a direct impact on their daily duties. Our hope is the reader will become informed of new legal precedents so they have a clear understanding on how to proceed in future contacts. However, these posts are presented as informational-only! The Blue Sheepdog Crew are not attorneys, and this post does not constitute legal advice, direction, or training. Officers and readers should consult their Department Legal Advisors, local Prosecutors, or personal attorneys before acting on the legal principles discussed here. Officers may frisk persons lawfully stopped and believed to be armed (photo from YouTube). The job of being a Police officer seems to be getting more dangerous in these last few years. Although crime in general is still at historically low levels, the increase in violent crime against police officers is on the rise. This is coupled with a growing and organized anti-police movement, along with an ambivalent and sensationalized media. The atmosphere for police and citizen contacts has been toxic in the last few years. 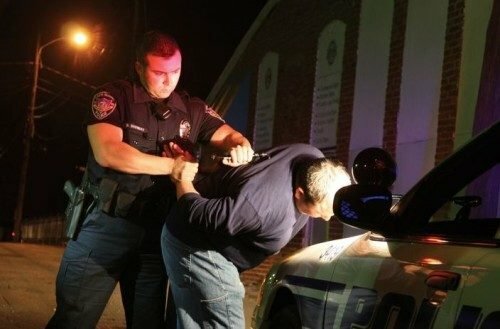 Officers must remain vigilant on duty, staying up-to-date on officer safety techniques and procedures to prepare for, counter, and win a dangerous or deadly encounter. At the same time, police officers have sworn an oath the uphold the U.S. Constitution, and the Constitution of their State. This means an officer is charged with protecting the sacred rights citizens possess, and to uphold the laws of the jurisdiction they serve. When an officer performs an enforcement action they must be keenly aware of what the law allows them to do, what the law prohibits them from doing, in the foremost context of the freedoms guaranteed our citizens by the Constitution. This often gray area is where the courts rule on “reasonableness,” and it is imperative for officers to have a strong working knowledge of both Constitutional and Statutory law to successfully navigate the myriad of interactions they may be faced with. The professional officer must be able to navigate this sometimes legal minefield, with expert knowledge and incredible tact. A sign of true professionalism and skilled experience is being able to properly assess a situation, and then handle the situation accordingly. Understandably time is a critical factor, and there may not be enough to allow the best analysis. When we do have time we should clearly communicate our expectations, and be patient enough to observe for compliance and answer questions. Vehicle stops are inherently dangerous (photo by Eden Prairie, MN PD). EDITOR’S NOTE: BlueSheepdog is committed to providing our law enforcement readers the best coverage of legal matters, training, firearms, and gear reviews that effect officers every day while on duty. The concepts and views in this article are those of the author (a 20-year police officer, Lifetime NRA member, and concealed carry advocate). Though we discuss Court cases and decisions, and make several recommendations, we are not attorneys. Nothing in this article should be construed as legal advice or counseling. This article is for informational purposes only! We encourage our readers to study the principles laid out here, and then evaluate them in light of the laws in your local jurisdiction. If you have legal questions you should seek counsel from your local prosecutor, Department legal counsel, or a licensed attorney in your jurisdiction. In the case of U.S. v. Robinson (2017) the U.S. 4th Circuit Court of Appeals ruled that officers may frisk citizens they have lawfully stopped and reasonably believe are armed, despite the possibility a citizen possesses a valid concealed carry permit (CCP). The 4th Circuit Court considered their own previous rulings for legal precedents, while also relying heavily upon some of the most influential U.S. Supreme Court decisions in Terry v. Ohio (1968) and Pennsylvania v. Mimms (1977). The Robinson case involved a witness reporting to the police Robinson was loading and then concealing a handgun near a convenient store. This particular store was known to police for high crime and drug activity. Robinson then left the area as a passenger in a car, and the witness provided a good description of the vehicle and direction of travel. Within minutes, police officers in West Virginia located the vehicle, and noticed neither occupant was wearing their seat belt (a primary violation in West Virginia). The officer conducted a stop based upon the call and the observed violation, with back-up arriving almost immediately. The officers ordered Robinson out of the car rather than have him reach for identification. The backing officer asked Robinson if he had any “weapons” on him. The officer testified Robinson did not answer, but responded with a “oh crap” look. Robinson was then frisked and a loaded pistol was seized from his front pants pocket. The officer knew Robinson was a convicted felon and placed him under arrest. Robinson was charged in U.S. District Court for being a felon in possession of a firearm. Robinson first sought a motion to suppress the firearm, but the District Court denied the motion and he was convicted with the right to appeal. On appeal Robinson acknowledged the officers had a reason for the stop, and could even legally order him out of the vehicle. However, Robinson claimed the frisk violated his 4th Amendment rights and therefore his conviction should be overturned. This appeal was based on the argument the officers could not have known prior to the frisk if Robinson possessed a valid CCP, therefore making the firearm possession legal. The U.S. 4th Circuit Court of Appeals rejected Robinson’s arguments, and upheld his conviction. 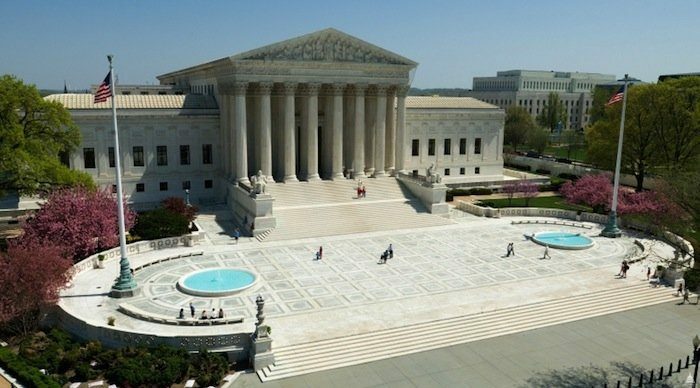 The U.S. Supreme Court has provided significant guidance on lawful frisks (photo by Architect of Capitol). The person was lawfully stopped by police. The officer(s) reasonably believed the person was armed. The Supreme Court has ruled that officer’s have the legal right to be free from violence during an investigation, and a tool to ensure their safety is the frisk under the (2) restrictions listed above. Both of these conditions were met in the Robinson case, and the Court ruled the frisk was legal. Therefore the firearm discovered was allowed into evidence and Robinson’s conviction was properly ordered. In the original Terry v. Ohio ruling, the Supreme Court had used the words “armed and dangerous” in confirming the officer’s frisk was reasonable and legal. However, since then the Federal Courts have acknowledged when a person is armed a reasonable officer may conclude their weapon is dangerous regardless of the legality of its possession or carry. 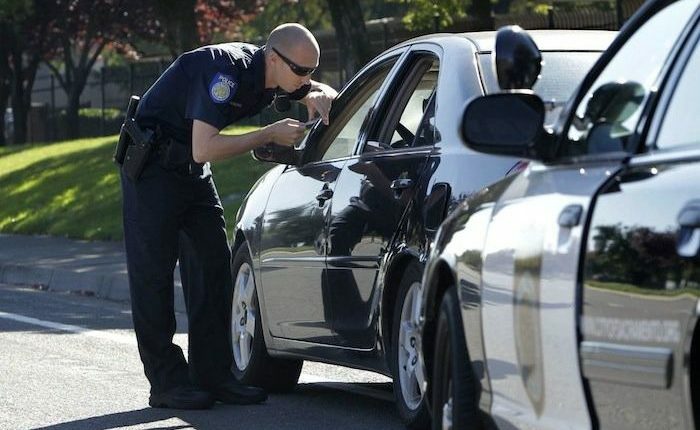 The U.S. Supreme Court has ruled traffic stops are so inherently dangerous for officers, they have provided a rather broad set of guidelines allowing officers to maintain control of the occupants and still remain within 4th Amendment restrictions. This is the pivotal component that we discuss in this article. With the new ruling in U.S. v. Robinson a lawful citizen, carrying a firearm legally, may still be subjected to a frisk by police officers. This justification is based upon the Supreme Court’s (2) requirements: the person was lawfully stopped, and the officer has reasonable belief the person is armed. The frisk is legal regardless of the citizen’s possession of a concealed carry permit. This no doubt will ruffle the feathers of concealed carry permit holders, who have a remarkable reputation for being law-abiding citizens. We’ve just discussed briefly the legal rulings on the “how” this situation could legally happen, so let’s look into the individual responsibilities of the officer and armed citizen to determine the appropriate “when” and “why” this might happen. Currently, the decision in U.S. v. Robinson (2017) is only legal precedent in the U.S. 4th Circuit. This includes West Virginia, Virginia, Maryland, North Carolina, and South Carolina. However, a prudent student of the law will also acknowledge that other U.S. Circuit Courts of Appeal frequently rely on decisions from the other Circuits when making decisions. This presents the best means of keeping Federal law as consistent as it can be nationwide. Studying and knowing the Constitutional guidelines and local laws is imperative. Know your local laws on concealed and/or open carry of firearms. Maintain your officer safety skills in every contact. Respect the Constitutional rights of the citizens you encounter. 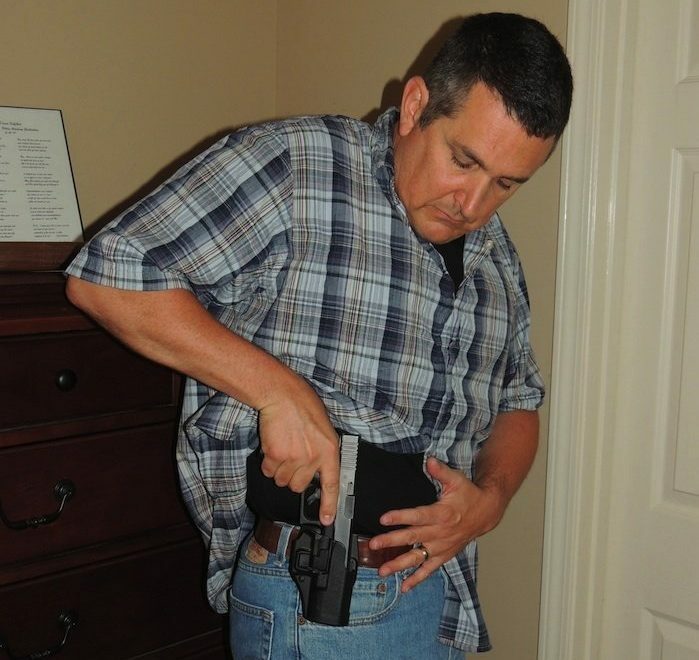 Recognize Concealed Carry Permit holders are highly law-abiding citizens. Prepare a dialogue to communicate with armed citizens. Be willing and prepared to answer questions or concerns. During a contact with a citizen carrying a concealed or open carry firearm, establish your expectations early and clearly. Most Concealed Carry Permit (CCP) holders are remarkably law-abiding citizens, and will gladly comply with reasonable requests. With this in mind, the tactics and communication style an officer uses should be welcoming but direct. Officers should avoid a confrontational approach, without some other threat indicator from the citizen. Remember, a cool-headed approach in these situations will go a long way in establishing your professionalism, while still providing you the full spectrum of officer safety techniques. Much like officers in jurisdictions that allow personal amounts of marijuana now, officers must understand the probability of coming into the presence of firearms today is much higher. However, most of those firearms will be in the hands of lawful citizens who pose no harm to the officer. Jumping into hyper-drive simply because a person has a (legal) firearm in their vehicle is not only unprofessional but may very likely earn a valid complaint or lawsuit on an infringed right. Like in any confrontational situation, the actions or reactions of the officer plays a critical role in the de-escalation of the event. If the officer immediately throws up their guard, becomes demanding and authoritarian, and refuses to listen to the citizen, then you can expect resistance from a person who fully believes their actions are legal and guaranteed under the Constitution. A confrontation under these circumstances is unnecessary and unprofessional. Immediately ordering a citizen out of their vehicle, securing them in handcuffs, and confiscating their firearm is another recipe for disaster. Not only a public relations nightmare, but likely a sustained complaint of officer misconduct. There are ways for the officer to secure the citizen and/or firearm that will satisfy the officer’s concern for safety, and respect the lawful citizen’s Constitutional rights. If the officer commits to open dialogue with the citizen, and clearly explains and defines the expectations they have, the situation is much more likely to transpire beneficially for both sides. This can be done with the officer maintaining every advantage of position, and remaining at Condition Orange on the range of officer alertness. Officers can and should retain all of their officer safety tactics during these encounters. However, a momentary pause (with full sensory alertness) before jumping into action, can save hours of unnecessary paperwork and frustration. When contacting citizens on enforcement contacts one of the very first officer safety considerations hammered into officers from the Academy, Field Training, and beyond is: “Watch Their Hands!” Our hands are so pivotal to daily life that almost everything we do involves some hand movement. The most common body parts used in an assault on an officer are the hands. This dash-cam picture shows the driver firing on officers with an AK-47 (photo from YouTube). Push – create distance for harsher attack, into traffic, off bridge, etc. Shoot – pistol, revolver, shotgun, rifle, officer’s own sidearm, etc. Hit with blunt object – bat, pipe, bottle, 2×4, chair, etc. Detonate explosives – IED, hand grenade, gasoline, etc. 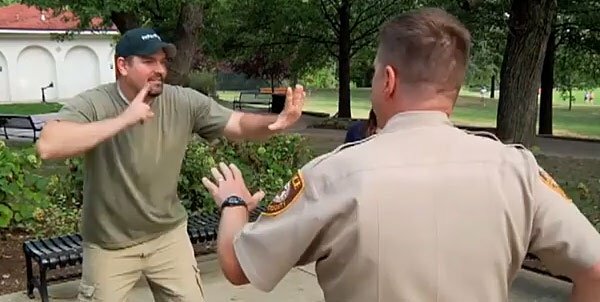 Not every armed citizen encounter needs to rise to this level of officer safety! These are just a quick glance of all the potential threats officers must consider and prepare to counter when conducting an enforcement stop on a citizen. Especially, when the officer learns or knows the citizen possesses a weapon, or is highly trained in fighting skills. 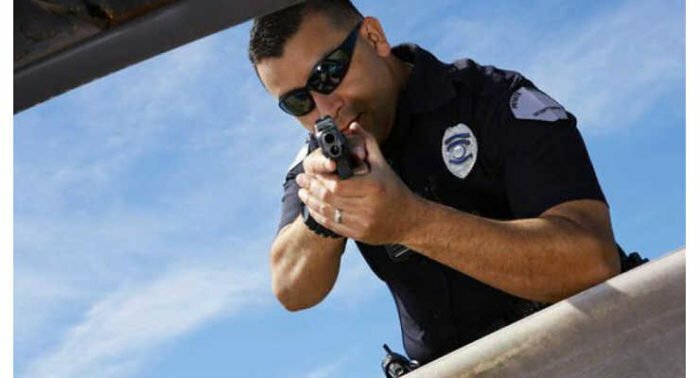 However, if the citizen’s hands are clearly visible, they are cooperating, there are no other indications they may be violent, AND the officer has maintained a proper reactionary gap, then communicating in an open and non-authoritarian manner can provide a mutually beneficial contact and outcome. When learning about a lawful concealed carry firearm, the officer can quickly tell the citizen they appreciate this revelation, but then calmly and clearly express there are a few requirements to ensure your safety. Most law-abiding citizens will be more than willing to accommodate a few reasonable restrictions. Officer expectations should be clear, and any questions should be answered so both parties understand their part. Communication is key for a mutually beneficial police and legally armed citizen contact (photo by Salon Police). When an Officer comes into contact with a person and either identifies or is told the citizen is in possession of a firearm, there are several key tactics the officer should consider in properly handling the situation. First, the officer should instruct the citizen to keep their hands in a clearly visible location, if they are not already doing so. The officer should then determine the location of the firearm. Once this information is received I typically provide a simple but clear instruction to refrain from moving their hands near the firearms location. Remember, I’ve already established where their hands are located. Request the citizen keep their hands visible during the entire contact, and leave the firearm in the enclosed container. Request the citizen exit their vehicle so the remainder of the police contact can be conducted away from the stored firearm. Request the citizen exit their vehicle, and the officer then secure the firearm until the completion of the contact. Request the citizen exit their vehicle, ask them if you can see the firearm, retrieve the firearm for inspection in a safe manner decided by the officer, examine the firearm, decide to keep or to return the firearm to a secure location in their vehicle, decide if the citizen can return to their vehicle or must remain outside. I will be straightforward with my law enforcement readers. I have performed all three options in my career. However, when my State passed a shall-issue Concealed Carry Permit law early in my career, I ceased exercising Option #3 when confronting permit holders except when there was specific information they were dangerous or involved in some kind of disturbance. Only then would I exercise Option #3, but I would clearly communicate the reasoning for my actions. I chose to leave Option #3 because carrying a concealed firearm was now a lawful activity. In my opinion, Option #3 is the most egregious and intrusive form of encounter to someone who is lawfully in possession of a firearm. Remember, the U.S. Constitution guarantees the “right to bear arms.” If your State goes further to provide a legal means for persons to carry firearms concealed and/or in their car, officers are confronted with the legal dilemma of a legal activity that could present danger. Unless there is some other indicator of resistance or threat, I believe Option #3 is unnecessary and tap-dances on the citizen’s 2nd and 4th Amendment rights. However, the U.S. v. Robinson case would at least imply this option would still be legal, as long as the seizure of the firearm is kept to the relatively short time to complete the vehicle stop. The purpose of a frisk is to ensure the person is not armed. The Supreme Court has consistently upheld an officer’s authority to seize a weapon found upon a frisk, pending further investigation. In deed, the whole purpose of the frisk is not evidence gathering, but the ability of the officer to conduct an investigation without the concern of violence to them. Still, I do not recommend Option #3. What condition will the firearm be in – loaded/unloaded, safety on/off? How familiar are you with the action and safeties of their particular firearm? Returning an unloaded firearm creates a concern when they naturally want to reload. Additionally, if the firearm is temporarily seized, the officer has a legal obligation to protect and maintain the firearm in the same condition as it was received. By this I mean the exterior, interior, and action of the firearm. We should not be returning firearms with scuffs, marks, broken pieces, or fouled actions. Any damage will subject the officer, department, and governing agency to civil liabilities. 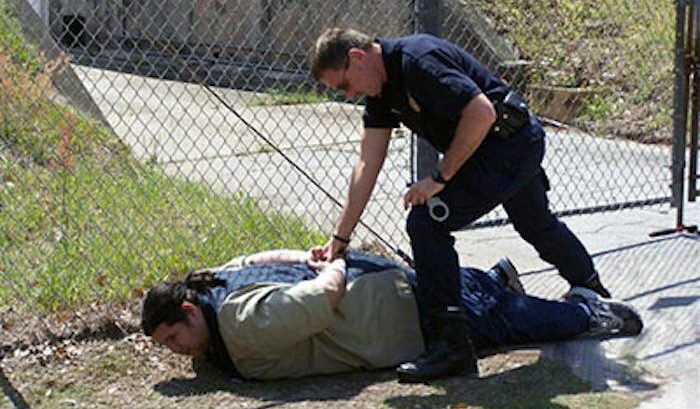 Frisking for weapons is one of the most dangerous activities for police (photo by Boydd Products). Finally, when returning to the stopped vehicle (or even pedestrian check) one of the primary officer safety rules is to keep your sidearm hand free. If you’re walking up with a ticket book, ticket, pen, driver’s license, insurance, registration, CCP, flashlight already, where in the world do you expect to carry the CCP holder’s firearm. As stated, the safest return method is unloaded, so now you add an empty firearm (slide locked back, or cylinder open), a magazine, and at least one loose cartridge. It’s just not a good idea, and the other options I’ve listed should be used in my opinion. If the CCP holder is carrying the firearm on their person, or the firearm is in the open and easily accessible during the time of the police encounter, the situation takes on a slightly more dangerous element. It is more reasonable for an officer to take a more proactive approach to these encounters, to ensure the firearm is no longer in an easily accessible location. However, this should still be considered and handled on a case-by-case basis. Request the citizen keep their hands visible during the entire contact, and leave the firearm on their person or in the clearly open and identifiable location. Request the citizen exit their vehicle so the remainder of the police contact can be conducted away from the vehicle and their hands can more easily be watched. 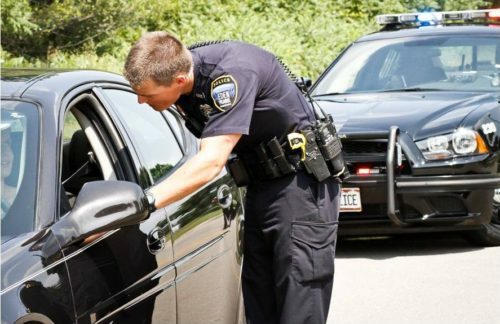 Request the citizen exit their vehicle, explain you are going to frisk them to retrieve the firearm, and the secure the firearm during the course of the encounter. Request the citizen exit their vehicle, explain you are going to frisk them to retrieve the firearm, examine the firearm, and place the firearm unloaded in a secure location inside of their vehicle. Whether the citizen returns or remains outside is up to the officer. Once again, Option #3 is going to be the most egregious and intrusive method, and will most likely result in a host of vocal opposition. If the officer chooses to go with Option #3 they should be patient enough to fully explain the legal authority to conduct their actions, and assuage some of the citizen’s fears by assuring them the firearm will be returned at the end of the encounter as long as everything checks out and compliance is achieved. Many officers feel an overwhelming need to control the firearm and/or person during a contact like this. In addition, some officers believe any time they encounter a firearm they need to check the serial number for any wants. Though each of these desires is understandable, and to a point reasonable, I feel both are unnecessary and legally precarious. If the person is not resisting and shows no signs of violence, their possession of a firearm is a lawful activity if your State laws allow that. 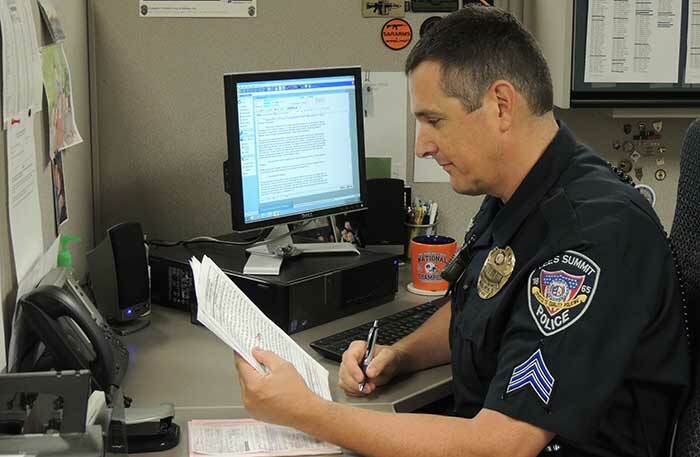 Another consideration for officers to consider is a CCP holder had to submit to a criminal history check, and in most cases go through a firearms course to obtain their permit. Not that every civilian firearms course is worth the money or certificate, but the point is they made the effort to comply with the law. As stated before, CCP holders are some of the most law-abiding citizens in America. In my personal experience I have found CCP holders to be very forthcoming and cooperative during a stop. Most tell me up front they have a firearm (though not required by my State’s law), and already have their Permit ready for inspection. Anytime I have asked about weapons, the CCP holder has admitted possession and provided the firearm’s location. I have performed Option #1 and Option #2 on numerous occasions resulting in a safe and reasonable contact with an armed citizen. During these contacts I have kept up my diligent observations of the citizen(s) and have not felt at threat simply because the firearm was still with them or the vehicle. In every case the Permit holder has been appreciative of the manner I have treated them, and has been very compliant with any requests I have made from them. Remember Newton’s Law of Inertia: “an object at rest will remain at rest unless acted upon by an unbalanced force.” In this regard, a firearm itself sitting in a holster, or lying in a seat or container, is not going to hurt the officer unless acted upon. If the officer can clearly identify where the citizen’s hands are, then they have a reasonable belief the firearm will not hurt them unless the citizen moves towards the firearm. An officer must maintain an elevated sense of situational awareness during this contacts. At the same time they need to accurately gauge the situation for what it really is. Through proper observations, decision-making, and communication the need to escalate will rarely be encountered. There is a lot of trust and respect to overcome mutual fears here. 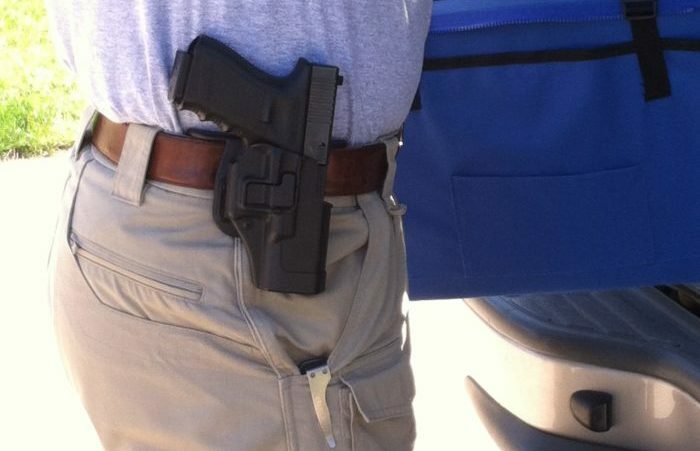 Open Carry is legal in many States, presenting its own unique concerns. See the second weapon? Now that I have covered the responsibilities, authority, and options for law enforcement officers confronting a lawfully armed citizen, let’s turn our attention to some of the responsibilities the lawfully armed citizen should consider. Just like the officers were instructed to be reasonable and avoid confrontational tones or actions, the lawfully armed citizen should be open and clear about their status, firearm location, and any other reasonable request by a law enforcement officer. Carrying a loaded firearm is a huge responsibility. Anyone who chooses to carry (and Blue Sheepdog supports this) needs to ensure they are very familiar with their firearm, its safeties and operation, and their selected holster. On-going training to provide familiarity and proficiency with your firearm cannot be under-emphasized. This includes practical drawing, shooting, and retention skills; as well as, maintaining a constant study for understanding the updated legal requirements for carrying a firearm and the use of deadly force. Some States do not require a Concealed Carry Permit (CCP) holder to inform law enforcement of their armed status immediately upon contact. I understand the privacy issues here, and respect the right of those individuals to exercise that right. However, I can say from experience when a Permit holder is upfront and forthcoming with this information it makes the contact go much smoother. A question a citizen should ask is this, “does the right to privacy outweigh the potential reaction from the officer who later discovers you’re armed.” Especially if that discovery is connected to a furtive movement, or an argument over the nature of the stop. Only you can answer this question. The BlueSheepdog Crew highly recommends that a CCP holder have their permit out and ready for inspection, along with their driver’s license, insurance and possibly registration (if commonly requested in your State). This simple act sends a strong signal of compliance to the officer and can quickly help to alleviate any concerns the officer may have. In addition, having the documents ready quickly will avoid any potential “furtive” movements you may make that could change the context of the contact in a much more negative way. In addition to the documents, a verbal acknowledgement of your armed status will be greatly appreciated by the officer, particularly during low-light encounters. Providing this information, and the location of your firearm, illustrates a great deal of compliance and understanding for the dangers an officer faces. You are much more likely to receive a positive contact by first starting off prepared and open about your armed status. Being argumentative or failing to comply is contradictory to a good outcome. Most Concealed Carry Permit holders are willing to comply with reasonable directions from police officers during enforcement contacts. However, a small percentage become offended and even passively resistive of complying with lawful commands they do not feel are appropriate. As we mentioned from the U.S. v. Robinson (2017) case, despite the concealed carry laws around the country, the Courts are still appear willing to provide broad discretion to officers to secure their safety during citizen contacts. With that in mind, you will not be standing on solid legal ground if you refuse to comply with a reasonable direction from the police officer. Terry v. Ohio: The U.S. Supreme Court ruled that an officer who has reasonable suspicion to believe a crime has been, is, or is about to be committed may stop those persons for a limited investigation to verify the original suspicion. Reasonable suspicion can be described as a set of clearly identified observations, that would lead a reasonable officer to believe a person(s) have been, are, or are about to be involved in a criminal act. In addition the Supreme Court ruled, that an officer who reasonably believed the person(s) stopped were armed and dangerous (articulable facts) could conduct a pat-down frisk of the outer clothing of those persons. A frisk is an open-handed pat-down to feel for weapons, however if an officer comes across other contraband readily identifiable (say a drug smoking pipe) during the frisk, that established probable cause to search that area and seize evidence. Graham v. Connor: This U.S. Supreme Court case is the benchmark guideline for officer conduct when interacting with citizens. The Court overruled previous standards that required an officer’s actions to “shock the conscience” to be a violation of a citizen’s rights, and instead set the standard of conduct to be evaluated as “objectively reasonable.” In this view, an officer cannot be held liable for a Constitutional right violation (42 U.S. Code Section 1983) unless the actions of the officer were not objectively reasonable. The Court went further to explain the standard of judgment was to evaluate the accused officer’s actions in light of what a “reasonable officer” in the accused officer’s position might do. If a “reasonable officer” might conclude to do the same actions, then the accused officer was not in violation of the Constitution. Additionally, the Supreme Court forbade lower courts from looking at the officer’s actions in the clarity of 20/20 hindsight, but rather acknowledged police officers are often required to make life-and-death decisions in a fraction of a second under tense, uncertain, and rapidly evolving circumstances. In short, if the officer’s orders and actions are reasonable they are right. Pennsylvania v. Mimms: This landmark case by the U.S. Supreme Court provided legal guidance to officers conducting vehicle stops. In the Mimms decision, the Court ruled that officers were perfectly within their legal authority under the 4th Amendment to order the driver to exit the vehicle. The ruling acknowledged that inherent dangers facing officers during traffic stops, and intended to provide the officer the greatest means to ensure their safety during these involuntary enforcement contacts. As such, a failure to exit the vehicle upon an officer’s instruction will likely subject the driver to arrest for failure to obey, resisting arrest, obstruction of justice or similar laws. Maryland v. Wilson: In this case the U.S. Supreme Court transferred the same legal consideration about drivers of vehicles stopped from the Pennsylvania v. Mimms case, to the passengers of vehicles that are lawfully stopped. In its decision, the Court stated the dangers to officers from passengers is just as great, and in fact makes the stop in general more dangerous because of the presence of more people. This case also provided officers legal authority to detain passengers of a vehicle stopped, preventing passengers from simply walking away. The Court saw this activity as paramount to the danger officers face, and therefore the temporary detention was reasonable. Though the Court acknowledged passengers have a greater interest in liberty, because the driver is the one most likely to have committed an offense, the Court nonetheless ruled the presence of passengers in the vehicle being stopped did not change the officer’s ability to control their movements (ordering out, or ordering to stay put). In its reasoning the Court explained the passengers were being stopped anyway because of their presence in the car, so the minimal intrusion into their freedom from seizure did not outweigh the officer’s legitimate interest for safety and protection. Conclusion on Court Cases: As you can see from these (4) foundational Supreme Court cases the Courts are very cognizant of the dangers officers face when conducting involuntary enforcement contacts. This is particularly true during vehicle stops, and low light conditions. Combine these decisions with the latest U.S. 4th Circuit Court of Appeals decision in U.S. v. Robinson (2017), and a CCP holder must understand the courts lean towards the safety of officers even when the citizen may be performing an otherwise lawful activity (carrying concealed where allowed). With this knowledge in mind, it is paramount for the lawful concealed carry citizen to know the law and be prepared and willing to comply with the law if directed by a police officer. The Robinson case may not be popular on the civilian side; however at least in the U.S. 4th Circuit, it is the law. This means a lawful concealed carry permit holder may still be subjected to being ordered out of their vehicle, and to being frisked. Despite the legal rulings, I still believe a forthcoming concealed carry permit holder and a reasonable police officer can find a mutually beneficial means of interacting and concluding the contact. Patience on both sides will be required, and open dialogue will be paramount. So far I’ve laid out the best practices for both police officers and civilian CCP holders. It has also been tailored for the best interactions between police and CCP holders. Obviously these ideal encounters are not always the way things go down. If a civilian is confronted with a more authoritarian, direct, and bossy officer there are some actions and considerations the CCP holder should be prepared for to minimize a negative outcome. In the worst case scenario for both police officer and CCP holder, the officer becomes very authoritarian and controlling. It is bad for the officer because their fears and elevated safety procedures tend to override more sensible approaches that still satisfy necessary officer safety. It is also bad for the officer because it leaves a good citizen with a bad impression of law enforcement. It is bad for the citizen because they are likely to respond with anger, resentment, and forms of disobedience (whether internally or externally). This only heightens the officer’s concerns, often leading to a much less desirable process and outcome. Control techniques may look harsh, but be perfectly legal (from Pinterest). Though the authoritarian approach is obviously not ideal, the officer may very likely be completely within his/her legal authority, 4th Amendment Constitutional guidelines, and his/her Department policies. Please try to remember, the introduction of a weapon in an unknown situation is always stressful. 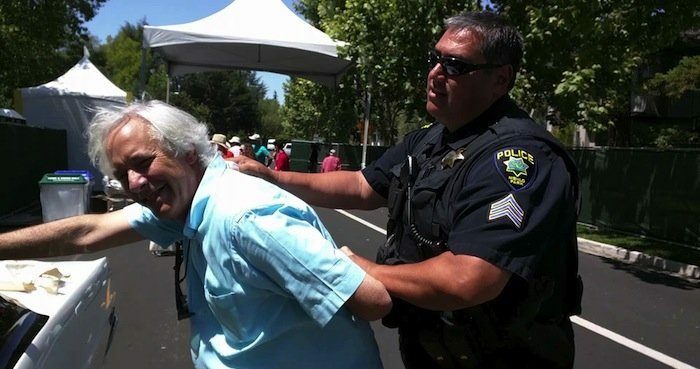 Some officers handle it better than others. First and foremost keep your hands in a clearly visible location! As we’ve mentioned, if the officer orders you to not move – DON’T MOVE! You are perfectly able to ask questions, but there is a time and place – read the situation! In the authoritarian officer scenario, if you maintain a calm and collected response, the worst outcome will likely only involve some dirty clothes, frustrated feelings, and a delayed release from your stop. However, if you go above and beyond to counter, contradict, challenge, or disobey the officer the worst case scenario is you are arrested, your car impounded, your firearm placed into Police Property for safekeeping, and even a little rough handling depending upon your level of resistance. None of this is necessary. Though an officer may come across rude, bossy, uncaring, or forceful their actions will likely be within the Constitutional parameters for temporary seizures, and within Department policy. If you understand that going into a potential encounter like this, you will likely avoid a much bigger problem than hurt ego or pride. The BlueSheepdog Crew are avid supporters of the 2nd Amendment and its guarantees to citizen ownership and carrying of firearms. Our staff is made up of mostly Lifetime Members of the National Rifle Association (NRA), and we have supported Concealed Carry of firearms pretty much since we could form an opinion on the matter. This site is specifically tailored to law enforcement officers. However, we know and understand that civilians frequently visit our site as well. We hope this informational guide on Concealed Carry Permit holders and Police officers enlightens our readers and challenges them to seek out more understanding on the laws for concealed carry in their local jurisdiction. Let us know your experiences encountering legally armed citizens. If you are a civilian we would love to hear about encounters with police officers – good and bad. We hope this forum will be an open discussion for both law enforcement and civilian perspectives, so that each side can learn, understand, and interact with each other more beneficially. My comment is I had a salvage/major repair to my right shoulder and a major repair to the left shoulder my arms no longer go behind my back. I’m not resisting. I also need a hip replacement. I have a handicap placard and use a cane for long walks or standing, in my 60’s. If you put me on the ground you will have to assist me getting back up. I legally carry with a permit. I’m polite and compliant and have Veteran plates on my vehicles. I still am able to ride my Harley but getting on and off is awkward. I have no criminal record, no drugs and no alcohol. No duty to inform in Colorado, but I place my CCW on top of Driver’s license, registration and proof of insurance and never say gun. I will tell you were the weapon is if you haven’t already asked. Hands on steering wheel or hands on the handlebars. So what’s the problem? How come you’re having contact will police? Rear ended, DUI/Drug check points, at night when you’re looking for the DUI and out of State with Colorado plates (not everyone in Colorado smokes weed). I’ve come across some really aggressive cops. Some of us are actually on your side, so please done be a jerk. Jack your comments are spot on! You are doing everything a reasonable person or officer would expect or request. All I can say is keep doing what you’re doing, and hopefully any further contacts will be more low-key. I know I, and my fellow officers in my area, would be very appreciative of all the steps you’re taking, and would respond in kind. Unfortunately, there are areas of the country where heavier policing is more acceptable (at least within the police agencies). The Northeast comes to mind; as well as, California. One You’ll also notice these areas of the country have some of the harshest civilian firearms laws in the country, which sets the tone to some officers. Every State has “that police department” or “that officer” but hopefully most are becoming better informed of the law and Constitutional rights. On the one hand officers are trained to “take charge” at stops, or calls for service. Since most officers patrol in one-officer cars, there is legitimate reasons to control movements of people during stops or calls. On the other hand is the reasonable expectation of people to be treated fairly and with respect. Often times it takes experience on the job (and with the right mindset established by the department) to get officers to feel confident in their officer safety, AND be able to talk and deal with people reasonably. Jack your comments are spot on! It sounds like you are doing everything a reasonable person or officer would expect or request. All I can say is keep doing what you’re doing, and hopefully any further contacts will be more low-key. I know I, and my fellow officers in my area, would be very appreciative of all the steps you’re taking, and would respond in kind. Unfortunately, there are areas of the country where heavier policing is more acceptable (at least within the police agencies). The Northeast comes to mind; as well as, California. You’ll also notice these areas of the country also have some of the harshest civilian firearms laws in the country, which sets the tone to some officers. Well said. Heavy policing. Most. CCW carries are on your side. I know some police especially CA and North East (NY, NJ) have a negative tendency towards firearms and citizens. I am retired LE and carry in all 50 most of the time. I would not tell anyone I am carrying unless a search is imminent. I can think of no good reason to do so and several why I shouldn’t. You are well within your right (in many States) to hold that information back, and as we mentioned not telling the officer may not ever become an issue as the interaction stays focused on the original contact. I also fully understand your concern about offering the information, as some officers go a little overboard with officer safety and controlling the firearm. However, if any movement would require going my near the firearm, if you are asked to step out of the car (many Troopers commonly do this to have drivers sit in their car), or the officer asks, it is our opinion that a notification of possessing a firearm are not only warranted but wise as well. Great post and comment, thanks!